Primary Natural Resources copper, zinc, lead, coal, gold. 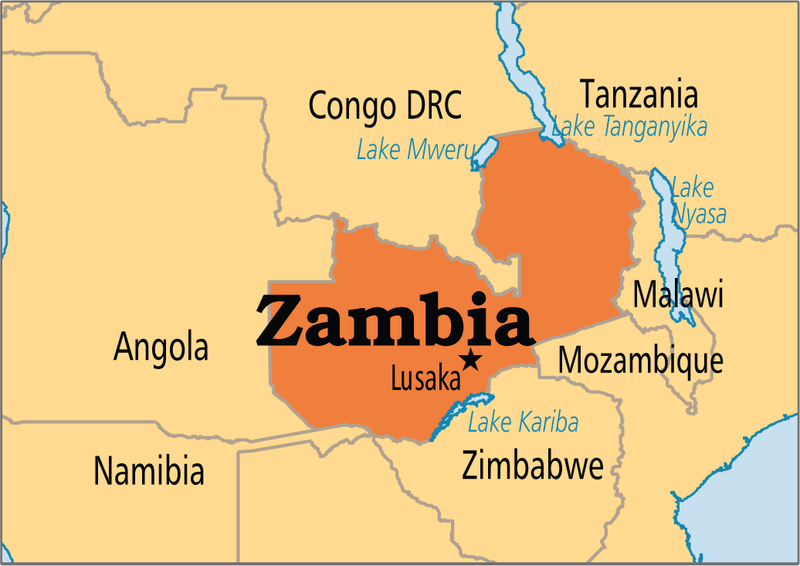 ZAMBIA IS LOCATED in central Africa and is slightly larger than the state of TEXAS. It is completely LANDLOCKED, with the Zambezi River forming a natural boundary between Zambia and ZIMBABWE to the south. Zambia is also bordered by CONGO to the north, by TANZANIA to the northeast, by MALAWI to the east, by MOZAMBIQUE to the southeast, by ANGOLA to the west, and by BOTSWANA, NAMIBIA, and Zibambwe to the south. The Cuando River forms part of the Angolan-Zambian border. The Luapula River forms the western border with Congo in the northeast part of Zambia. Along the northern border are Lakes Mweru and TANGANIKA. Bangweulu Lake is in the northeast along with the Muchinga Mountains. These mountains reach up to the Nyika Plateau at 7,120 ft (2,170 m). Zambia is a fairly uniform plateau of granite with an average altitude between 3,280 ft (1,000 m) and 4,265 ft (1,300 m). The Zambezi River, running along the southern border of Zambia, is one of the most scenic rivers in the world. The Zambezi flows over a series of waterfalls and rapids such as the Ngonye and Ngambwe rapids, the Kariba Gorges, and the famous Victoria Falls. Victoria Falls is approximately 1 mi (1.6 km) wide with a maximum drop of 420 ft (128 m). David Livingstone, a British explorer traveling in the area in 1855, named the falls after British Queen Victoria. Victoria is actually a series of falls separated along the top by a series of islands. After flowing over Victoria Falls, the Zambezi River flows into Lake Kariba, which was formed by the Kariba Dam and is one of the largest artificial lakes in the world. It then flows through central Mozambique and finally out into the Mozambique channel of the INDIAN OCEAN. There are several swampy areas in Zambia, including Bangweulu Swamp in the northeast, Lukanga Swamp and Kafue Flats in the center, and Luena Flats and Busanga Swamp in the west. Within these areas are large concentrations of animals, including elephants, lions, rhinoceroses, and several types of antelopes. Zambia has created 19 national parks that make up 8 percent of the land area of the country. The largest of these is Kafue National Park, just west of the center of Zambia, and North and South Luangwa National Parks in the east. Being a hub in the heart of the African continent where southern and central Africa converge, Zambia is also a convergence of the people of Africa. There are about 75 languages and dialects spoken in Zambia, with just as many ethnic groups. Most of these speak Bantu dialects, but the official language is English. The major tribal groups in Zambia are the Tonga to the south, the Kaonde to the northwest, and the Bemba, Bisa, and Lala to the northeast. Most of the tribal groups are very small, and each constitutes less than 2 percent of the population. Zambia became independent from the UNITED KINGDOM on October 24, 1964. From that time on, it has been a constitutional republic with a multiparty democracy and a president who is elected to five-year terms. Zambia is one of the world’s largest producers of copper. The copper belt in northern Zambia has the greatest population density in the country because of all the original employment in the mines. Copper prices have been declining for over 30 years, which has not helped the Zambian economy. Zambia is one of the poorest countries in the world by per capita annual income and yet it is one of the most urbanized countries in Africa. Unemployment and underemployment are major problems in Zambia, along with the rapidly expanding population that is increasing at a rate of 2.3 percent per year despite declining national life expectancy.